I know people wait for me uploading the videos from the February RLUG meet and I am delaying more than usual but is not my fault!, all the blame is on crappy video hosting services, especially blip.tv. When you upload video presentations from your Linux User Group you obviously want them in a Free format and playable out-of-the-box on a Linux box, so Flash-only is not a solution, YouTube is not a solution until they will have guaranteed WebM delivery (I upload there HD videos, they are still Flash-only)... the best solution seems to be blip.tv, but it fails the expectations very often. I complained it in the past when the frustration was big enough, then it worked for a while and now again it does not work: quickly after the meet last Thursday I started editing and uploading and by Friday everything was up... but queued for Flash conversion, without what playback is almost impossible. In the past when the conversion failed, it failed after a few hours, this time they are stuck: waiting in the queue and nothing happening. We're huge fans of free software and OGG in particular. We're very much looking forward to the day when a majority of Web video is encoded using free tools like OGG. 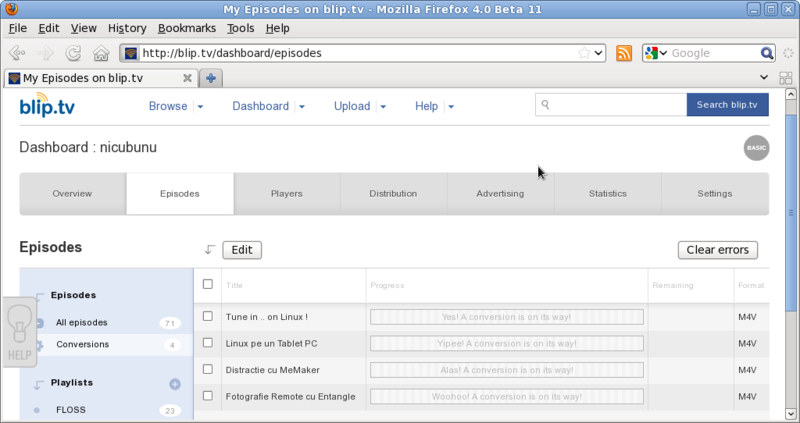 That said, unfortunately, blip doesn't offer any active support for .ogg or .ogv conversion to Flash. It works sometimes, but not always. We use ffmpeg and ffmpeg2ogg for conversion to an intermediary format, and from there to Flash. Unfortunately it's hit or miss. Until we have a reliable OGG/OGV transcoding solution (and we're working on it) you're probably better off uploading MOV, WMV or FLV files as your "primary" format. You can still upload OGG/OGV files as an "alternate" format so that people using GNU/Linux can watch in that format if they choose. Thanks for nothing! Sweet talk and no action - they didn't even look at the files, they are still "queued", it was a standard answer (and is true the Theora tools sucked always, that's why the format pretty much failed). But enough with apologies, I have to deliver something, surely people are waiting... what can I do is to link directly to the OGG sources on blip.tv, people will be able to see them with a competent browser and blip.tv won't receive full page views and ads display... sorry, they let me with no choice. And, of course, there is a photo gallery from the event, hosted as usual on our Fedora local website. Since I was lazy enough not to prepare formal slides, under the excuse my presentation were live demos, showing applications in use, I feel I needed to deliver more, so as they were short enough (remember, lightning talks), I also uploaded them on YouTube: Entangle, MeMaker. I have no idea what to do with my videos next month, suggestion welcomed. I'd say it's about time we do our own video hosting. We certainly own the hardware and the audience is local anyway. If you (or any other reader of this blog) can suggest a nice webapp to ease the presenting (and maybe upload & conversion), i'd be more than happy to set it up. i know no webapp, it would involve manual transcoding to flash for the cases where is needed (if we want to do that) and manual embedding with the VIDEO tag (with flash fallback if the case). You can use Vid.ly to process your video and keep a copy ;) Or… you could just use them for hosting. They seem decent enough. Upload your videos there. You can upload Ogg Theora and/or webm if you want and they will work fine for you. The process of uploading and editing the metadata can sometimes be painful because of little glitches in their system... but if you are patient, it seems to me to be the obvious place to post videos. And they do not convert them into flash. I have posted a number of video conversions to archive.org myself in webm format. Some folks like high quality, large bitrate videos... but I prefer lower resolution (between 512 and 624 width) and lower bitrates (300kbit video, 64kbit audio at 10 FPS) for technical talks because they save on disk space and the quality is just fine for the low action / motion... and they are quicker to download and stream much better. Streaming OGG directly using VLC on rlug server?